This looks like a near-perfect platform for learning synthesis with Arduino – and it’s just US$30 (with an even-lower $25 target price). 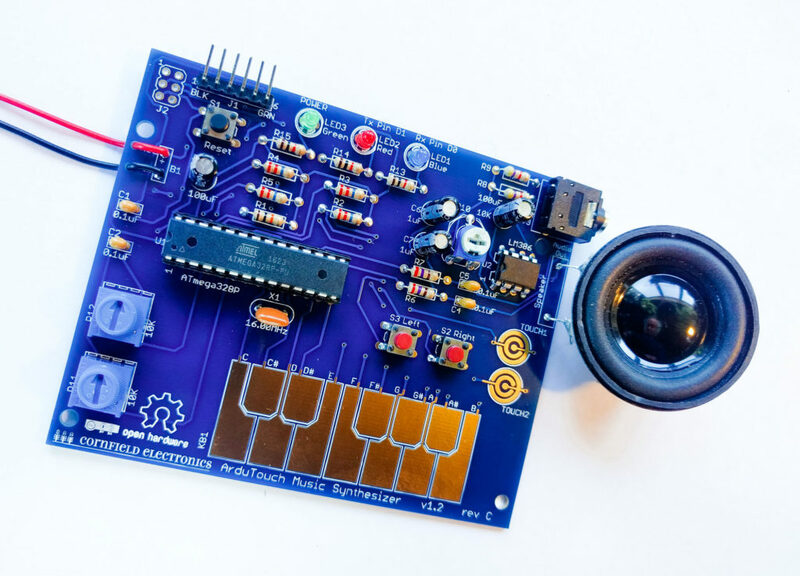 It’s called ArduTouch, a new Arduino-compatible music synth kit. It’s fully open source – everything you need to put this together is available on GitHub. And it’s the work of Mitch Altman, something of a celebrity in DIY/maker circles. Mitch is the clever inventor of the TV B-Gone – an IR blaster that lets you terminate TV power in places like airport lounges – plus brainwave-tickling gear like the Neurodreamer and Trip Glasses. (See his Cornfield Electronics manufacturer.) Indeed, some ten years ago when CDM hosted its first MusicMakers / Handmade Music event in New York, Mitch happened to be in town and put us all in a pleasant, totally drug-free trance state with his glasses. He’s also a music fan, though, so it’s great to see him get back into music synthesis. You don’t have to code. Just put this together, and you can start making music. Software. ArduTouch is a new library that enables the synthesis capabilities of the board. This means you can also customize synth functionality (like adding additional control or modifying the sound), or create your own synths. Tutorials. When you want to go deeper, the other side of this is a set of documentation to teach you the basics of DSP (digital signal processing) using the board and library. In other words, what you’ve got is an all-hardware course on DSP coding, on a $30 board. And that’s just fabulous. I’ve always thought working on a low-level with hardware is a great way to get into the basics, especially for those with no previous coding background. Looks like I’ve got a summer project. Stay tuned. And thanks, Mitch! This obviously needs videos and sound samples and the like so — guess we should get on that!